Raised in the Bronx, New York, Ms. Lindsay is accustomed to hard work and working for the interest of the people. A former schoolteacher for 24 years in the Yonkers and New York City public school districts, Ms. Lindsay has worked passionately to improve the lives of her students. Always going beyond the call of duty, she worked with underserved families in her district to ensure that her students and their families were receiving adequate social services that they deserved. Her experiences during her long career in education has fueled her desire to impact education on the national level to dismantle the school-to-prison pipeline by changing existing legislation. Thirteen of her twenty-four years as an educator have been in an urban school setting. During that time, Ms. Lindsay realized that the educational system did not ensure the success of Latino and African-American children; their schools are underfunded and overcrowded, leading to under-education. This background has ignited her desire to assist African-American and Latino children, by providing educational opportunities that otherwise would not have been made available to them. Those experiences have also given Ms. Lindsay the first-hand knowledge that is necessary for accurately identifying the problems and the sources of those problems in our education system, while effectively contributing to the solution. In direct line with contributing to solving the problems in our educational system, for nearly five years, Ms. Lindsay has been the Chairperson for the Scribe’s Institute Inc., a non-profit organization fully dedicated to reducing the achievement gap in minority children and disenfranchised people through a forthright approach to strengthening literacy skills. Ms. Lindsay has avid experience as both a teacher and an administrator. The experience gained in both fields of education has made her an effective asset in helping to shape education for minority children. Ms. Lindsay is admitted to the Bars of the states of Connecticut and New York. She has also been an adjunct professor at Mercy College Graduate School of Education in Dobbs Ferry, New York, and is a member of the George W. Crawford Black Bar Association, and The Alexander Hamilton Inn of Courts. She earned a Bachelor of Science in Nursing from New York University, a Master of Arts in Secondary Science Education from The City University of New York, a Master of Science with distinction in School Building Leadership from Mercy College, and a Juris Doctor from Touro College Jacob D. Fuchsberg Law Center. She received many distinctions during her college career, such as The Susan Marie Dietrich Clyne Scholarship, The Sheila and Stuart Salkin Educator Scholarship, the Touro Law School Commuter Scholarship, the CALI Award for Academic Excellence in Administrative Law, and the Touro Law Center’s Pro Bono Service Award. 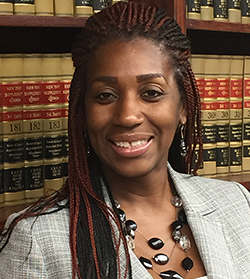 As a proud graduate of Touro Law Center, Ms. Lindsay intends to provide a voice, advocacy, and legal representation for those who often go unheard. Ms. Lindsay’s longtime passion has been centered on community building. When she entered the field of education more than twenty years ago, she then believed that the most effective way to bring justice to the masses was through education. Since entering the field of law, she now wholeheartedly believes that justice will best be served in the court of law. Ms. Lindsay is intent on becoming the best litigator in the United States, being an active part of the process and the solution.